Ideal for those who want to spend a quiet holiday in contact with nature, for families with children and elderly. The house, a typical rural Tuscan-Emilian Apennines, is surrounded by green spaces, enriched with fruit trees and conifers. It is not uncommon to see families of deer and deer in the front lawn. At about 100 meters from the house, along a downward path you can reach the river Savena, where the pristine landscape is protected by woods and features Included rocks. The site is strategically located to visit Bologna (about 30 km), Florence (about 65 km) and the nearby Tuscan cities (Pisa, Siena, Lucca, Arezzo), Ferrara and Ferrara beaches (about 80 km), Rimini (about 130 km) and Venice (about 200 km). For visitors to the international exhibition EXPO Milano 2015 stresses that Bologna is just over an hour by train from Milano Centrale. Therefore, the Chiusello may be an optimal solution to match an experience of rural life with the cultural events offered by the spectacular Italian cities. During the summer you can taste seasonal horticultural products entirely organic locally grown by the owner's son. During the weekend the owners organize short courses approach to the environment and organic farming, held by two young agronomists. Beautiful place with helpful hosts! We stayed for 18 days and enjoyed day trips to the surrounding country side. We also went to Bologna and Florence by train. Great location away from the crowds. Quiet and peaceful. Anna was very helpful in suggesting things to do. We also hiked some of the many trails in the area. Met friendly locals, region was very scenic!!! Apartment was in a charming farmhouse with everything you need at a reasonable price! ese activities and also others. Just ask and we will help you ! We spent 7 days at Borgo Chiusello last july and I must say IT WAS GREAT!! We were four of us and we felt ourselves at home there. The flat is wide and confortable, the host family was kind and gave us suggestions about places to visit (Bologna, Florence and Ferrara). The house surrounded by green fields so it is the ideal place for children ( we have two of 7 and 10). Just one point against: no markets, no shops nearby (about 7 km far). La soluzione ideale per una vacanza rilassante a contatto con la natura incontaminata e lontano dagli stress della città. Il posto è tranquillo e silenzioso, la casa pulitissima, dotata di tutto il necessario, confortevole e molto fresca. I proprietari sono gentilissimi e disponibili. L'appartamento si trova a pochi metri dal fiume Savena dove abbiamo fatto qualche pic-nic e abbiamo anche pescato la cena! Consiglierei questa soluzione anche a chi desidera visitare le vicine città come Bologna, Ferrara, Modena, Firenze, Venezia (noi siamo andati Venezia e a Firenze in treno da Bologna in circa 40 minuti). La posizione permette di raggiungere queste città in poco tempo soggiornando al contempo in un luogo dall'atmosfera bucolica. La casa era molto pulita e i proprietari molto cordiali all'arrivo. In quattro si sta ampiamente comodi, il locale è evidentemente ristrutturato di recente, buona la fornitura di stoviglie. Il luogo è perfetto per una vacanza all'insegna del rilassamento e del contatto con la natura. Perfetto per chi ama andare in bici tra il verde, con il sottofondo dello scorrere del fiume. Da consigliare anche per una vacanza tra amici! 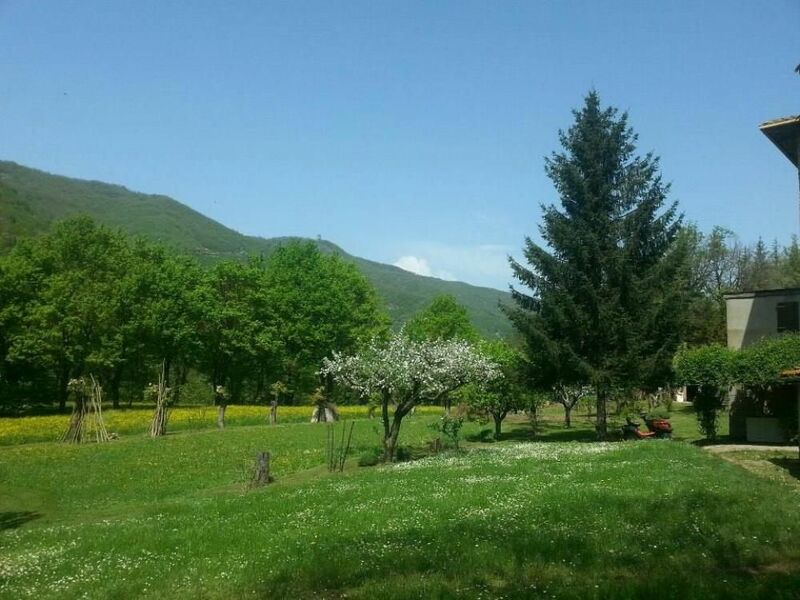 The ideal place for people who want to enjoy the peace of the countryside, walking, sunbathing on the lawn surrounding the house or on the banks of the river Savena (about 100 meters from the house) where you can also swim and fish. The place is surrounded by rolling hills, is peaceful and quiet but is also close to both Bologna (30km) and Florence (about 60 km). A few kilometers (about 7) there are villages and hamlets, very lively in the summer, where we organize festivals and markets characteristic (even antiques). These events become ideal opportunities to get to know the local people and their traditions. In these countries there are shops, supermarkets, swimming pools, tennis courts. The house is not far from a attezzato golf course (4 km), from a riding school (about 10 km) and a wellness center (half hour drive). In neighboring countries there are restaurants where you can enjoy traditional local dishes. It 'a very popular with mountain bikers who reach the Futa Pass on the border with Tuscany. Le tariffe si intendono per 4 persone. Fino ad un massimo di 6 persone si applicano le tariffe extra. Tariffe scontate per un numero inferiore di persone.